Banana Bingo is an online bingo site on the Dragonfish network: it features a rather unusual welcome page that is black, different shades of green and yellow. The only reference to a banana here is the small banana logo at the top of the page. Registration is easy and you have the option of depositing at the same time or you can choose to do this later from your account section. The bingo lobby shows you all the games available, some of the rooms are for funded players only. 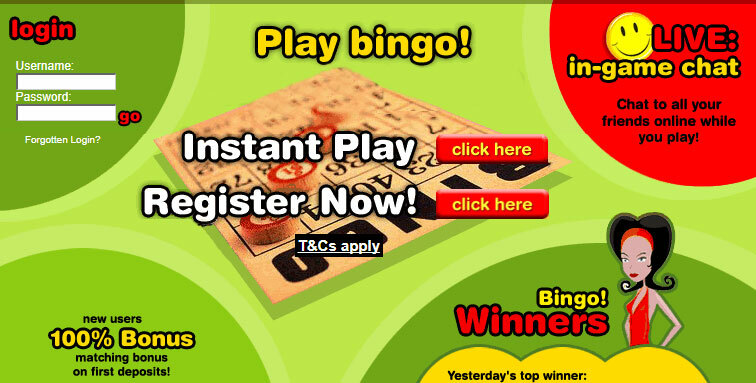 You can see up coming jackpot games, bingo, games and promotions. Buy your tickets in advance if you want to. When you enter the bingo room you’ll find the bingo tickets to the left, the chat box to the right and you also have the option to play chat games at the same time. The ticketing info shows you when the game is about to play, the price of the tickets, the prizes and the players in the game. Maximum bonus available is £100 and minimum deposit is £10. Live help is available in the ‘Help’ chat room once you’ve logged in. Tel: 0800 901 2510 24/7 in the UK. Banana Bingo allows you to play anywhere and any time you like, because you can play on your mobile or tablet device with no downloading required. Accessing the site via your mobile or tablet device, you will find that the bingo site is a scaled down version of the main site. You won’t find everything on offer but there’s still a huge selection to choose from.